Blade length(nagasa) :　67.0　cm or 26.4 inches. Sori :1.2 cm or 0.47 inches. Width at the hamachi :3.04 cm or 1.2 inches. Width at the Kissaki : 1.86cm or 0.73 inches. Kasane : 0.61 cm or 0.24inches. Shape : The blade is rather wide and thick with small sori and regula kissaki. Hamon :Niedeki suguha with soft feeling nioiguchi bright and clear. and the hamon and jigane is asa well as his maser’s. The originator of tameshigiri(cutting test)has a tradition of Anyoji Kaganokami or Tani Daizen. Anyoji Kaganokami is the samurai of the Kyogoku family of Omi prefecture. Anyoji Kaganokami has the tradition of having cutting tested by digging up a body from the grave. And Full name of Tani Daizen is Tani Daizen Moriyoshi. He was killed in war by the Harima Prefecture Miki castle attack with Besho Nagaharu. It is the origin of dotan giri that Tani Daizen placed and cutting tested the body on the ridge. and many pupils. Also His cutting test was inherited by Yamano school and Yamada school. It was very prosperous to the Edo period. The nickname of Yamada “Kubikiri Asaemon” is famous. Yamada family was the execution officer of the Edo Shogunate. And the founder of Yamada family is the Yamada Sadatake. Five generation of them continued. And Their work was finished with the Meiji era. A lower table is a wazamono table in Yamada family. Saya :blue shell kizami saya. Tsuba Mokko style iron tsuba mimi is covered by gold color and engraved maple tree, river water stream and a horse with gold color. Fuchikashira:on the syakudo plain plate, river stream and temples are engraved with gols color. Menuki : Horse riding goods are engraved with gold color. 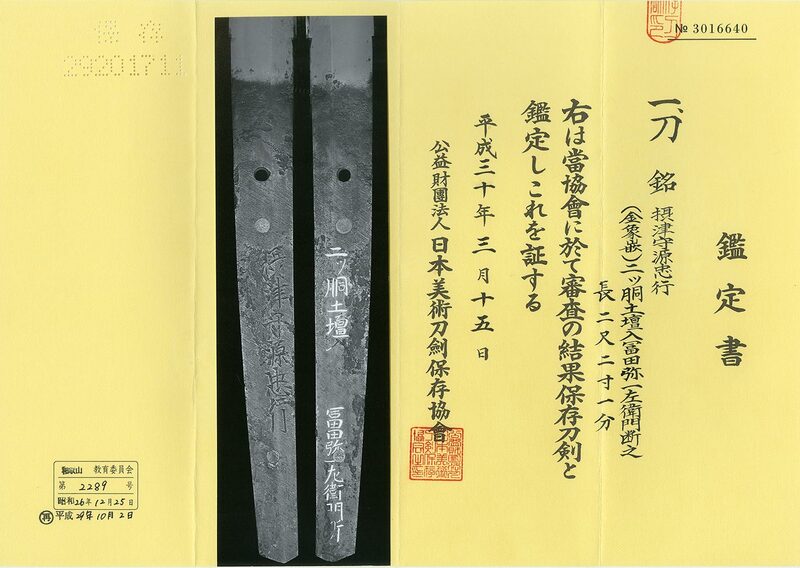 From Aoi Bijyutsu:Recently it is very hard to look for gold inlay Tameshigiri sword. bodies by Tomita Yaichi Zaemon Shigetsuna. on the Nakago. Probably the price must be very expensive. The ceremony was filled with dignity.